The first time you run 4DO, there will be a message at the bottom of the window that says "No BIOS rom selected". Click "Choose BIOS rom" and then select your bios rom file. It will be looking for a file with a .rom or a .bin extension. It is up to you to find your own 3DO BIOS file or extract it from your own system. We will not help you with downloading BIOS files. Once you have the BIOS loaded, the BIOS screen should be running. It will be just like the 3do console was turned on with no disc in the drive. If you would like to use a joystick or gamepad with 4DO, connect it to your computer before starting 4DO. As long as your controller is connected and working before you run 4DO, it should be detected and will work in most cases. To configure the controls for the emulated 3DO gamepad, click "Options" from the top menu bar, then click "Configure Input...". The controller configuration window will now be shown. 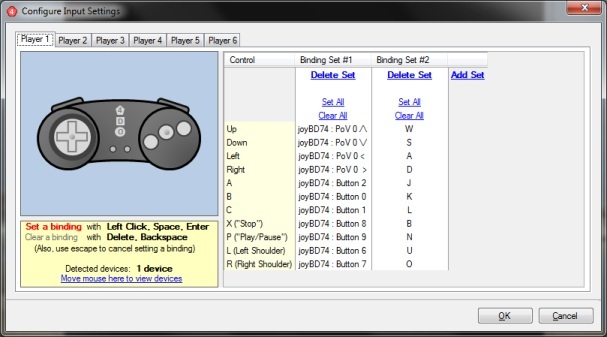 The configuration window allows for multiple configuration sets for each player (1-6). The easiest way to setup the controls is to click "Set All" on one of the sets then to hit a button or key for the current control. Which button on the emulated 3DO gamepad you are setting up is listed on the left side of the first set. If you need to change the control for one button, just click the control you want to change (click inside the set) and it will wait for you to press a button or key. When you are done, click the OK button at the bottom. There are two main ways of loading a 3DO game in 4DO. You can play games using a 3DO game CD, or you can load a CD Image file (*.iso, *bin, *cue). To play a 3DO game CD, simply place the game disc in your cd drive of your computer. Then click "File" from the top menu bar, then click "Open Disc Drive" of the drive you put the game disc into. The game should begin loading. If you have a CD Image File of a 3DO game on your hard drive, you might be able to use it on 4DO. The image file can be .ISO or .BIN/.CUE format. Also, 2352 and 2048 bytes per sector are supported for both formats. If it does not meet these requirements, you may be able to convert it or use a Virtual CD Drive. If it does meet the requirements, click "File" from the top menu. Then click "Open CD Image File" and select the CD image file on your hard drive. If you have a .CUE for your image file, It is strongly encouraged to select that file for proper loading. The game should begin to load. Games might also run a little better from CD Image files too. To play the game in full screen, you can use the shortcut F4 key. You can also click "Display" in the top menu and then click "Full Screen". Use this option to end the game and to go back to the BIOS screen. Use this option to load *.CUE, *.BIN, *.ISO files as CD images. They can be in Mode1+2048 or Mode1+2352 format. Use this option to load a 3DO CD from the selected CD Drive. When this option is checked, the last CD Image or 3DO CD will be loaded and auto-played on start up. This option will allow you to re-choose a BIOS rom file. This option will let you select a BIOS Rom 2 file. This was an extra BIOS chip on Japanese 3DO Consoles that contained the Kanji Font. Some Japanese games require this second BIOS to run properly. This will close the emulator. This will save the state of the emulation, to be recalled again. Basically, you can save anywhere with this option. This will let you load the save state that you saved. When this option is checked, the save of the currently selected save slot will automatically load when the game is loaded. In this menu you can select which save slot you are currently using and change it if need be. You can have up to 10 save states for each game. There are also shortcut keys to go to the previous (F6) and next (F5) Slot without having to use the menu. This option will create a *.png image file with the date, time, and the name of the game as the file name. It will be put into a folder called Screenshots in the 4DO directory. You can also use F3 as a shortcut to this function. This will completely pause the emulation. This will reload the 3DO system and will load the game you were playing or the BIOS. This will enable Full Screen mode. You can disable Full Screen by hitting the Escape Key or hitting the F4 key. The Menu can still be accessed in Full Screen mode by moving the mouse cursor to the upper left of the screen. There is also another shortcut for Full Screen by hitting Alt + Enter. When in Full Screen on a wide screen monitor, the borders on the left and the right have a pattern by default. You can change the pattern or turn it off completely in the menu. You can also enable or disable the grey border around the video output. This will smooth the pixelated look of the re-sized image at the cost of some blurring of the image. This will ensure that the video output maintains the 4:3 aspect of a 3DO console. If the user has specified to preserve aspect ratio, crops may result in an aspect ratio different than native. This is automatically expanded to the available area. Thus, games that attempt to simulate widescreen can actually be played in the intended widescreen format. This will ensure that in Windowed mode that the window can only be re-sized so that optimal video output is still maintained. None - This will render the video in it's normal output. Double Resolution Rendering - This will render anything that is 3D in 640x480 resolution. This has no effect on 2D games and images. hq2x, hq3x, and hq4x - The hqx filters are full-screen post-processing operations that provide benefit via color matching. There is noticeable improvement on flat fonts or cartoon-style sprite graphics. 3DO games with video or photo-realism are much less likely to see benefit. These hqx filters are very CPU intensive. If your performance is too low for you, you can typically sacrifice game framerate by turning down the CPU Clock Speed in the Advanced settings tab. You can use this menu to change most of the options of 4DO under one single window. General Tab - This tab has settings for start-up options, auto loading save states, and options for when 4DO is an inactive window. Display Tab - This tab has settings for how the image is displayed and how to handle the borders on 16:9 displays in full screen mode. Scaling Mode Tab - This tab has settings for changing the current Scaling Mode that the video rendering is using. Advanced Tab - You can change the CPU Clock Speed, and the Audio Buffer Size on this tab. Changing the CPU Clock Speed might get rid of slow down in some games but will use more of your computer's processing power. Increasing the audio buffer can possibly get rid of clicks or stutters in the audio at the cost of the audio getting behind the video. Changing the CPU Clock Speed or Audio Buffer options can cause 4DO to have oddities or can even make 4DO become unstable. Just click the "Reset to defaults" button to return things to normal if they get out of control. You can configure your controller through this menu. When a game is loaded you can use this menu to see the game's Year, Game ID, Publisher, Region, Publisher, and other game info. You can see who is all responsible for 4DO and some thanks in this screen. This is located on the right side of the info bar. This is to help users identify when they have settings that are too intensive for their PCs. Green indicates normal operation. Yellow indicates that the emulation fell behind schedule once recently. You will hear an audio skip during the compensation, but the emulation should otherwise be fine. Red indicates that the emulation is chronically behind schedule. When this happens the framerate is likely too low and the audio is probably very annoying. This is located in the very right corner of the info bar. This is the current number of frames per second the emulation is running at. Not all software is necessarily supposed to be running at 60fps at all times. The Health Indicator gives a better idea if everything is running properly. 4DO has some advanced command line options that can be used via the command prompt or via a shortcut to 4DO.exe. Enabling some of the logging options will use more of your computer's processor and will slow down 4DO's performance. -StartLoadDrive [letter]  : Loads from CD of the drive letter. --StartFullScreen         : Start Full Screen. --PrintKPrint        : Prints KPRINT (3DO debug) output to console. --ForceGDIRendering  : Forces GDI Rendering rather than DirectX. --DebugStartupPaused : Start 4do in a paused state. Frequently Asked Questions will be put here to avoid them from being asked multiple times. Anything not here, check the Fourms to see if it's been answered. If it hasn't been asked, post a question and you will get a response as soon as possible. Q: Why don't Audio CDs play in the BIOS? A: This has been looked into and there is not a solution at this current time. It might get looked into at a future date. Q: Why do I hear pops and clicks in the audio? A: Most of the audio problems have been solved, but there will still be some noises when you do not have enough processor power for the specific game you are playing. You can also try increasing the audio buffer some on the advanced tab of the 4DO Options screen. Q: Do you know that this certain game has a bug? A: We might already know about it! We make the best attempt to update the Compatibility List as soon as we hear about and verify a game bug. Check the list to see if it is there first. If it is not, post about it on the Forums. Submitting updates to the Compatibility List is also encouraged! This page was last modified on 11 July 2016, at 09:30.